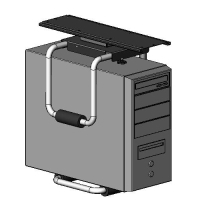 Under Counter CPU Holder(model #60605 series) - Sallas Industrial Co., Ltd. 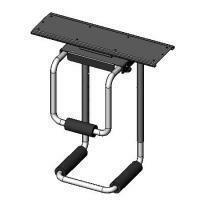 The under counter CPU holder is designed for mounting easily in various locations of desks and extensions for user comfort, power access and cable management. Elevates CPU above floor-level dust and allows easier cleaning of work area floor. Swivels 360 degrees for easy CPU access and cable maintenance. Adjusts to fit CPUs of width under (210mm)8-1/4". Suitable for almost any CPU height available in the market. Height from 230mm(9") to 530mm(21"). Soft EVA foam to protect CPU well from impact and falling. Easy install, no tool and no strap to be needed for height and width adjustment.